One of the first questions I am always asked is how to market a lawn care business. Whether you have been in business 15 years and have finally decided to get serious or are a hungry newbie wanting to know how to start a lawn care company this is the first place to start. There is a very specific order we step our clients through when we work with them grow their business… and here they are. Just implementing these first 10 steps correctly will give you an advantage over your competitors…. 1. Tell all of your friends and family you have a landscaping business. Send a personal message to all your Facebook friends in your target markets telling them what you do and ask them if them they need service or know anyone that does… make them a special offer. 2. Setup a Google+ Local page, verify it and get reviews on it. If you have tons of reviews and set it up correctly, this can be one of the most effective low cost things you can to do to generate revenue. 3. Buy a domain name. Setup a professionally designed website built to convert visitors to customers that is easily updateable by you and can be improved over time. This will be your number one salesman. Treat it as such by constantly improving it and adding new content to a blog. There are a lot of freebie options out there and if you have no budget this may be the route you need to take initially. However, move to a professional website as soon and your budget allows such an investment. 4. Get video testimonials from all existing satisfied customers. Use them on your website and marketing material’s. Ask them if you can use them as a reference. Get a photo at the bare minimum. Text only testimonials on your website are worthless. ○ Don’t invest a ton of time updating the page until you have a budget to advertise. Many other strategies are more effective for lead generation. ○ Not a replacement for a website. You want to get leads off of Facebook and into your marketing database as quickly as possible. You have to pay Facebook to market to your followers. 6. Have some professional door hangers made. Feature a strong guarantee of your service. If you are a small company feature a professional photograph of yourself and use a personal guarantee. 7. Knock on doors and sell your services. Dress professionally, preferably with a logo’d colored shirt. Leave them a door hanger and/or magnet. • What amounts you do and the results you get in new client sales is entirely dependant on the budget you can invest. 9. Implement a nurturing and upselling process that happens each month. a. This could be a combination of direct mail, and phone calls, but most commonly email marketing. b. Not just posting you will run a paid ads in conjunction with posts. You can get free likes from like ladders on Facebook but its not just targeting your area its all over but the more action you get on your page the mire it does get into locals news fed. We definitely do not recommend gaming Facebook that way. 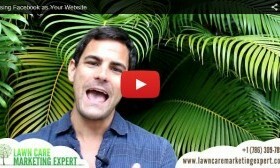 1 Pings/Trackbacks for "How to Market a Lawn Care Business – The First 10 Steps"